The idea for demolition derbies was conceived in the mind of a 28-year old stock car driver named Larry Mendelsohn. He staged the first demo derby at Islip (Long Island) Speedway in 1958. 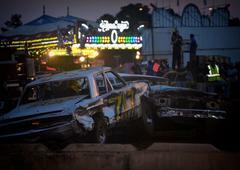 He had noticed how spectators were attracted by the crashes and smashes of stock car racing. Many of the fans were stuck to the edge of their seats not as anxious to witness skilled racing but to see the trauma and violence of the WRECKS! Why not create an automobile sport that would be ALL crashes? Hence, the now popular demolition derby was born.